Today was our day off but we did so much it hardly felt like a recovery day at all. I didn't go to bed til 2am last night typing up this and uploading the photo's onto FB. Breakfast this morning wasnt until 10am so I was able to have a bit of a sleep in. We had breakfast at Chances R. The french toast was pretty good, and I love french toast so thats a pretty big call. The tea was shite though. At 11.30am we all piled into 3 ParaTranspo taxis and went into the heart of Ottowa. It is such a beautiful city. Very green with huge beautiful buildings and a canal (which freezes over in the winter and people ice skate on). There are markets surrounded by little shops and shopping centres. When we were in Roots it started pouring down with rain so we stayed in there for a while. Kat was even given an exclusive Roots raincoat, made by the Roots manager himself! After 5 hours of wandering around, the Gliders all met up for dinner at the Hard Rock Cafe. By this time I was completely exhausted and very sore in the shoulders. I was actually sore when I woke up but I dont think the pushing around helped. At 7.30pm the taxis picked us up and took us back to the Residence. During the ride our taxi driver told us the various parts of Ottowa or near Ottowa we could find bears and moose. Since being back I have had my shoulder rubbed and am now sitting in bed. Will be an early night I think. Today we had a training sesion in the morning and then a game against the Netherlands at 5pm. In between those two sessions, I had accupuncture on my shoudler to hep relieve the tightness and pain. I like accupuncture despite my fear for needles. It works. It fixed my pinched nerve at the AIS camp earlier in the year and I felt an improvement in the tightness after having it today. I just dont like it when Miranda has a bit of a poke around every few minutes. We won our game against the Netherlands. They hit a few clutch shots throughout the game to keep them on our tail but our shooting and defence were better. After dinner we watched the 2nd half of that game on the projector with AC Ben O stopping it every so often to show us where we went really well and what we need to work on. We play them again tomorrow is the cross overs and I am feeling pretty confident. I'm not in the best frame of mind while writing this so don't expect anything long. We had our game against the Netherlands today. We lost. This was the game to win to get us in the grand final and we lost by 9 points. It was the game in Beijing against the USA all over again, except minus the mass crying session after. I still feel crap though. So tomorrow we play Canada for the 3rd spot. We have to win. Losing is not an option. Going from 2nd spot on the ladder to last is not an option. Its a very long flight home and I dont want to spend it moping. My job now is to get my head together, forget todays game, and concentrate on being physically and mentally prepared for tomorrow. Today it was the finals. We played Canada at 3pm for the third play-off. We won! Our defence was really good, causing loads of turn-overs and shot clock violations. We got alot of our baskets through transistions but also pulled it out and ran a few of our half court plays successfully as well. There was a point where they came a but too close for comfort but even though I managed to foul a Canadian shooting a 3 during the last few seconds (after being told not too, woops! sorry guys! 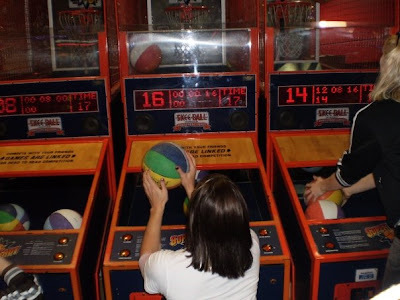 ), she didn't make all her free throws so we won by 4 points. Afterwards we went back to shower and change into civvies before going back to watch the end of the final game. It was awesome to see the Netherlands give the Germans a run for their money, even being up at some stages. But the Germans got their act together and won the "gold". I put gold in " because yes they came first but all they gold was one small clear glass/plastic (not sure) trophy for the team. The Netherlands and us Aussies received nothing. Hardly even a mention in the thanks for coming speech. All the teams then had dinner at Chances R. Everyone was treated to garlic bread and caesar salad as the entree and a rib eye and veggies as the main (except for our two food diva's who were able to order their respective vegan or vegetarian meals). It was either apple crumble or a fudge brownie for dessert. A highlight of the night was after the dinner when us Aussies taught the Netherlander's how to play cricket, except the hotel hallway version. It pretty much consisted of a dining chair as the wicket , a water bottle as the bat, and a soft ball as the cricket ball. No innings or running. Just trying to catch or wicket someone out. The Netherlands were really funny, they wanted more rules so that there could be a distinguishable winner. After a while, everyone had had enough and it dwindled down to just chatter in the hallways. I had packed sometime earlier in the day so I went to bed a bit before the other girls. It was schedualled that taxis take us to the airport at 9am which meant waking up at 8am to be ready and have breakfast. But because Kat was leaving with the Canadians to make her flight back home to Atlanta, I got up earlier to give her a big hug goodbye (not knowing I would see her later at the airport because her flight was delayed). The taxis were a but late but eventually we were at the Ottowa airport. Check in was a nightmare. Instead of adding the weight of the bags up as a team, each individual bag couldnt be more than 23kgs. So it took a while for there to be some re-packing, with the overweight bagged people puting stuff in the underweight bags. Then at customs they couldn't find me in the VISA waiver system so had to be escourted into another room where I gave them my receipt number to prove that I had actually done the right thing. Even though it didn't take that long for them to sort it all out, for that small amount of time I felt like a criminal. In the "naughty" room. Finally we were boarded on our flights (we were split onto 2 different flights to Chicago). We were able to choose which seats we wanted to sit in so I chose the first 2 seater to have to myself. It was one of the small planes where there is one seat, an isle, and then 2 seats. I slept the entire flight so to me it felt like we were hardly up in the air before the announcement was made that we were soon landing so please turn off all electrical devices and put away your tray tables. In reality the flight was no more than 2 hours long. Once we were in Chicago we didn't need to collect any bags because everyone had theirs checked into their own final destination. We had time to go get some food and meet some really rude Americans befor ewe had to go to our gate for our next flight. This time they put us all down the back in a 3 seat, isle, 3 seat plane. The Gliders were put together (except for me, I had 2 randoms next to me) and thankfully no one needed the loo because there were lows/mids next to each other with no way of stepping over each other. Again, I pretty much slept the whole way. 3 to 4 hours later we touched down on the west coast of USA and into one of the most disappointing international airports I've seen in the world. I'm disappointed because you would expect that an airport that is one of the main flight hubs of the world would be pretty good yeah? Like Singapore airport. Well in LA, in the terminal we landed at, there is only a Burger King, Starbucks and a Chili's. In the Tom Bradley terminal, the one we left from, there is a Maccas, a mexican place, a sushi place and a coffee place (thats not Starbucks, which was disappointing in itself because I really wanted to try what Kat had the other day: a banana and choc slush thing made with soy milk and a shot of espresso). So there isnt much to choose from if your like me and dont want to eat chili or seafood before a long flight. Oh, and there is nothing to do once past security. But enough complaining. Once past security, the Melbourne bound Gliders dropped the Sydney bound Gliders off at their gate before going to our own gate in the opposite direction. Tina, Dori and I went to sit on the floor by a wall and nearly didnt get to pre-board the plane because we didnt see the others leave to board and no one had came to get us. Matt had already organised for our tickets to be re-done to make sure we didnt have the same problem as we did on the Chicago to LA flight where lows/mids were sitting next to each other. So we ended up being upgraded to premium economy. On the airbus I had so much leg room that I didn't need but so much elbow room that I did. I had Dori next to me so she had plenty of room to step around me even though the floor at my feet became a playground of spare blankets, pillows and what not. This flight was the mother of all flights being 14 to 15 hours long. I slept for a good portion of it, being an over night flight, but I was also awake long enough to have meals, watch the new Fast and Furious movie and read my latest Picoult (Plain Truth). 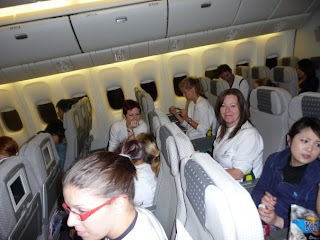 We landed in Melbourne around 7.50am on the Tuesday (4 August 2009). Somewhere in the air I lost a day. Good thing I (or any of the other Gliders for that matter) wasnt born on the 3rd of August. It didnt take Qantas that long to get us all off but duty free shopping (a huge Toblerone bar, and 50ml Chloe eau de parfum) and Customs took a while. Boarder Control was being filmed that day but I didn't see any cameras. Then again, I didn't try to smuggle in drugs or fruit either. 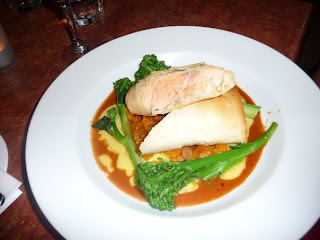 It was nice to have a shower in a proper shower and have a nice home cooked meal at Dori's. I'll be staying here until WNWBL on the friday. Dori and I haven't done anything but mope around the rumpus room and play on FB and I love it. Doing nothing is great after such a long time away. Ok so I apologise for not writing this straight after the rounds happend. So if the commentary is kinda boring, its because my memory has faded and am relying on the League websites. Firstly, it was the second Womens League round, held in Melbourne on the weekend of the 12th of June. Unfortunately, due to the current Oink Flu epidemic going on around the world, and with the high number of cases in Victoria, our HC John was unable to fly with us (he is a teacher). 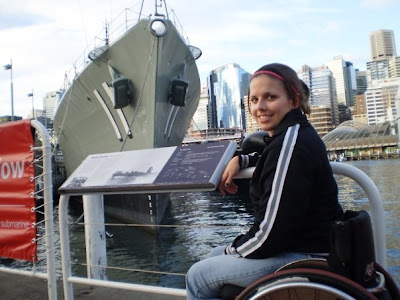 Therefore, AC Lee stepped up to play HC for the weekend, and Wheelcats physio Katie was able to fly with us (Stars physio Zoe was unable to fly to Victoria because she had prac in a hospital). So the Stars flew out 9am on the Thursday. Not after getting a headach from a certain check in chick who said I had to pay $220 in excess baggage. In my 5 years of basketball, never have I heard of my state team having to pay excess. So I sat there telling her to waive it, which left me negative 2 minutes to go to the loo before boarding my flight. We got into Melbourne around 2 in the arvo, met up with our interstate player Cobi, and was on our way to Dandenong. 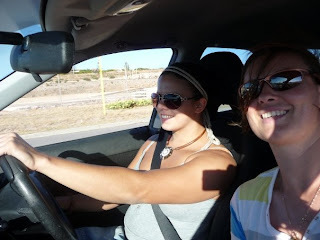 I was trucker chick with Lee, while the rest of the girls and Tom (as in GPS) told us how to get to our hotel while avoiding any kind of road toll. About an hour and half later, we arrived at the same hotel I stayed at with the Wheelcats a few weeks before (which by the way, only took like 30 or 40 minutes because we didn't avoid tolls!). After checking in, with Katie, Amber, Sarah and I in one apartment, Lee on his own, and the rest of the girls (Cobi, Alicia, Eileen and Mandy) in another apartment, we went out for dinner, breakfast shopping and then back to the hotel for sleep. The next morning we were able to do whatever we wanted until 2pm when we left the hotel for our 4pm game. So most of us slept in and then went to the Plaza for lunch. Both the 4pm and 8pm games were against the Hills Hornets, the team we beat by 1 in the first round in Perth. Pretty much the stats talk for themselves. We didnt do very well. I can't explain why, but we were shite. Despite improving in the second game, we ended the day with 2 loses under our belt. Not very good. That night we had pizza and movies, followed by bed. The next morning was pretty much the same. We had a lazy morning of watching Bambi 2 and then a sausage sizzle courtacy of Lee (who cooked the sausages in the kitchenette due to the coldness outside and the inability to light the BBQ). 4pm we played the Gladiators. Unfortunately the stats were not recorded on Live Stats so I can't be specific, but we were SO much better than the day before. Even I got a few good baskets. As a whole, we were awesome. We won that game fairly convincingly. Now the 8pm game was against the Dandenong Rangers. Erg! I say 'erg' not because we lost. We actually won. It was a great win as well. We were down by heaps and then the girls shot their lights out and won with a nice gap in front. I say 'erg' because at the end of the 3rd quarter, I was the meat (or nutella, whatever you fancy..) of a Shelley and Cobi sandwich. There was a whole lot of wheel, a whole lot of floor, and I ended up lying on my arm and bursting into tears. It wasn't that painful at all, but for some reason, like when you get hit in the nose, the water works started automatically. I remember hearing someone say 'just stay there for a bit, don't move'. So I did. I eventually turned myself over and was pulled up by HC and subbed off. Luckilly we had the physio there because even though my left elbow wasn't really in pain, it did feel slightly stiffer. Either way, it wasn't normal anymore. So after some ice, a short push around on the other court, and some strapping later, I was able to play the last 2 or 3 minutes of the game. By this time the girls were ahead by like 10 and the Rangers had resorted to fouling every time we had possession to send us to the line in hope to get the ball back quicker. It didn't matter though, our girls were hitting most of their FT's and we won. The next morning I was in pain. My arm had stiffened dramatically and was very sore to move. I had to lifted into the Truck (thanks Lee) because I was unable to transfer myself. I think the flight didn't help either. On the Monday, I booked myself in to see Loopy - the Rollers physio, and he told me I had partially torn my medial collateral ligament. The fact it hurt when he tried bending it too far meant that it wasn't severed completely and doesn't need surgery to be put back on. Which is good news. 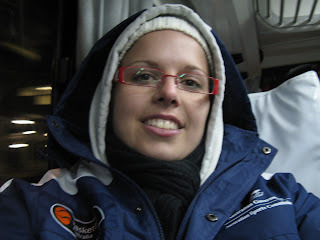 Bad news was that I needed to rest it, which meanr no training and no NWBL game that weekend, and purhaps no WNWBL games the following weekend. I wasn't a happy girl. I've never really been injured before and I hated to think that I would be disappointing my teams by not being able to train or play with them. 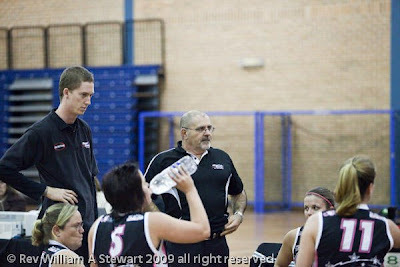 Luckilly, the boys were able to win both games against the Adelaide Thunder that weekend without me. It sucked watching from the sideline and not being able to play. Especially when things got a bit hairy and scary when a 30 or whatever point lead went down to 5 or 8. 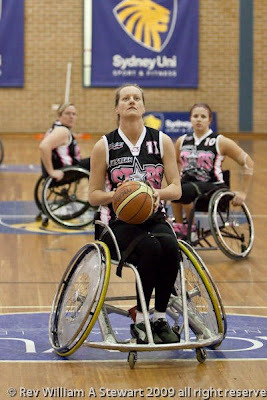 But in the end, it was 2 wins and the Wheelcats remain undefeated. 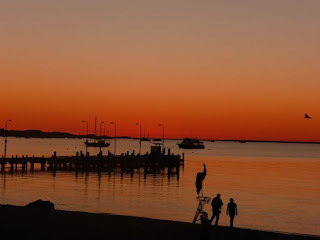 A few of the boys know what they need to work on and will hopefully be better and ready for the next NWBL round in Sydney at the end of July (I will be in Canada and will miss the round - so good luck boys! Will be thinking of you!!). 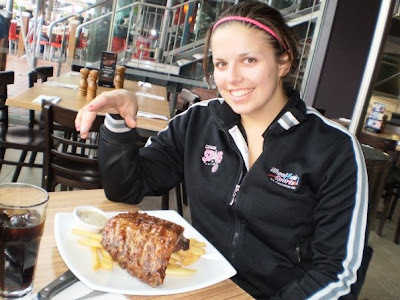 On the weekend, just before our first NWBL game against Adelaide, one of the Stars was involved in her first car accident and received a spiral fracture to her pinky on her right hand. She had surgery to make it right but will not be able to play for a while, which means not traveling with us to Sydney this weekend for the next WNWBL round. Thankfully, Loopy gave me the all clear to play this weekend, otherwise the Stars would have only had 1 sub. I will be on light duties because I dont want to be hurt and not be able to play in Canada, but I am still thankful that I am able to play. I am a basketballer at heart and not playing is a heartbreaker! 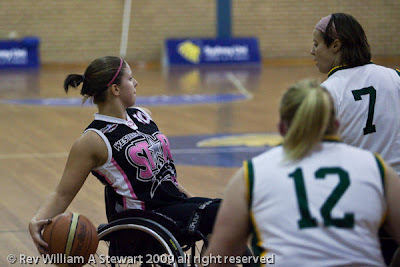 Perth held their first round of NWBL last weekend. It was against Woolongong, the team who we defeated in the final last year. The game started off a little shakey, with there being only 2 points between us at a few stages. But in the end we ended up winning by like 30. 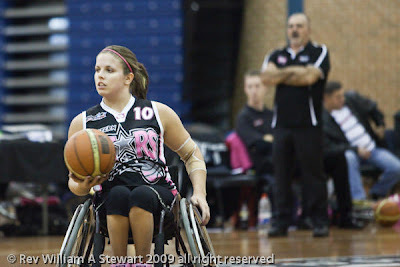 This morning the Western Stars fly out to Melbourne for their 2nd round of WNWBL. Fingers crossed for a few wins and not coming back with the Swine Flu! Our HC John isn't allowed to travel with us to Melbourne due to the Pig flu, so AC Lee will be taking over the role as HC for the weekend. 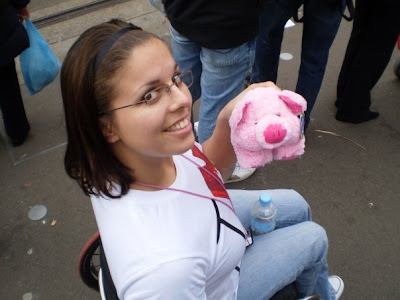 And Katie, the Wheelcats physio, will be coming as well to be an extra set of hands. If you can't be there, then check it out via LiveStats! Oh, and happy birthday JT! The Wheelcats flew out of Perth early Saturday morning (up at 5am so that Abdi and I could be at the airport for 7am - thanks to the guys who left me alone with my ipod, a tired Clare is a cranky and irritable Clare!) 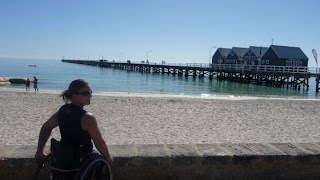 to arrive in Melbourne about 4 hours after take-off, for the first round of the National Wheelchair Basketball League against the Dandenong Rangers. Melbourne is a beautiful city but holy cow its cold! Good thing the heater in our car was working. We had about an hours drive straight to the basketball stadium with about an hour til tip-off to get organised. As a team we started off well, in the lead right from the start, but individually it took me a while to get into the swing of things. I was pretty shite in the first Q. Getting in my own teams way, unnecessary fouls, etc. etc. But I think I got into the groove of things, started reading the D a little bit better and working with my big a bit more. I must have been nervous at the start but hopefully I can leave those nerves behind, move forward, and be a great player right from the start of the game. We ended up winning 91 to 72, with 6 points being mine, which I'm happy with because in past years, I didn't tend to shoot that much in NWBL. I was too scared of missing and disappointing my team to want to try. But Coach has been drilling me out of that thought process, so I think I am improving in that aspect. My fellow low pointer, Abdi, was a gun, scoring 12 points for our team. Go the lows! I went to bed around 11 and had a nice sleep in til 8.30am, for a 9am breakfast followed by an 11am check-out. Our second game against the Rangers started at 1pm. We scored the first shot of the game, but 4 minutes into the game, Dandenong were up. However, it didnt take us long to catch up and accerated past them to win the game 99 to 68 (despite several unsavoury calls from the officials). I felt better in this game than the previous one. I only scored the one goal but I felt better in the other aspects of the game. Congrats to J for his triple-double and Shaun for scoring 47 points! The drive back to the airport was relatively event free, not really needing the road book ('can you see the Crown, Ben??'). After a slight delayed departure, we finally took off and after many hours of sleeping, reading or annoying the person in front or behind of you (*cough* Lee *cough*), we were back in Perth by 9pm. Next weekend we have a home round against the Woolongong Rollerhawks. Its just the one game on the Saturday but it should be a good game. Hopefully there will be a sea of red in the crowd! 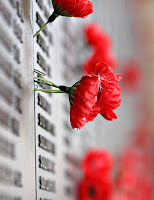 For any Non-Aussie/New Zealander's out there who don't know what ANZAC is.. Anzac Day is a national public holiday in Australia and New Zealand, and is commemorated by both countries on 25 April every year to honour members of the Australian and New Zealand Army Corps (ANZAC) who fought at Gallipolo in Turkey during World War I. Anzac Day marks the anniversary of the first major military action fought by Australian and New Zealand forces during the First World War. (and because I go to uni and have had referencing and plagerism drilled into me, I better just state that I copy-pasted that directly from old faithful Wikipedia - so for more info: click here). So its a nice long weekend for me! No uni on Monday or Tuesday morning (because no point in holding a tute for a lecture that didn't happen). Yeay! Not this weekend, but next weekend. As in Friday the 1st of May, its that scary time of the year again. 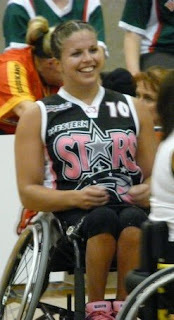 First round of the Womens National Wheelchair Basketball League ("WNWBL"). Like last year, the first round is being held in Perth. Which is good because we don't have to travel anywhere, so can't blame travel for being tired. We also have home ground advantage, playing on the court that we train on nearly everyday and having a crowd for support. That leads to my con for having first round a home round. So many people in the crowd that I know, to see me hit or MISS my shots, stick or totally screw up that pick, play awesomely (is that even a word?) or be completely shite. I know I'm not meant to think about it like that, in such a negative view, but I do. I hate disappointing people. I hate people seeing me fail. I hate thinking that people are probably whispering to others 'she's crap, she should have gotten that'. I tend to focus on the crap things I do in a game rather than the good things I did, even if the good things I did outway the bad. I suppose that is why I am never satisfied with the way I play during a game. Even if we won by 20 points and I got 3 from 4 free throws and 4 from 5 field goals, 10 rebounds, 2 steals and only 1 turn-over.. It is still 1 missed free throw, 1 missed field goal, 1 too many turn-overs and I didn't help my team as much as I could have. Im never happy enough. I'm always thinking I could have been better. The Western Stars were in the final last year (no we didn't win but hey, still the final!) so we are expected to be relatively good compared to the other teams. But we haven't played a WNWBL game since like August last year. We don't know if what we have done is good enough to beat the other teams. Have the other teams improved dramatically? Have they found a secret weapon that we aren't ready for? I hate the unknown. Sometimes its exciting. But in this case, it scares me. I HATE losing. That is what drives me to play so hard during a game. I hate losing for myself, I hate losing for my team mates, I hate losing for my coach, I hate losing for the crowd that supports me. I don't want to be a disappointment. If our home round wasn't the first round, then we would have already played a few games and have a few results under our belt and I would have an inkling to what to expect and what to tell my crowd to expect. You can't be disappointed if you don't have high expectations, right? I know I sound like a huge pessimistic princess right now, but hey, Im just being honest. Im probably abusing Blogger, letting it be my vent outlet, but my vents might make interesting reading. Especially for me, who can re-read this after the event. Hinesight is a wonderful thing. (who we are versing is totally irrelevant). All games are being played on court 1 of the Herb Graham Rec. Centre in Mirrabooka. See WSWA website for more info. 19th Feb 2009 - Opening ceremony. Same old, same old. Teams are introduced one by one as we wheel from backstage onto the court. 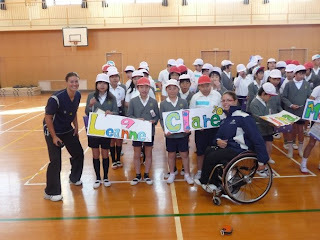 Then a whole HEAP of IWBF head honcho's make their speaches, welcoming us to Japan and to the Osaka Cup Friendship Games of 2009. Japanese speach then its english translation times about 6 times. Meanwhile, we are all watching the big screens above the court and wave stupidly when the camera goes on us. We then have lunch. 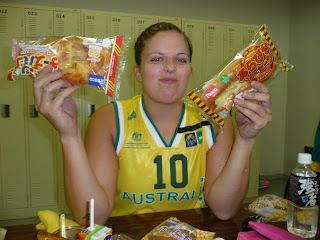 Sandwiches (no crust), orange juice popper (or fruit box, depending on the Australian state you live in) and a range of different and unknown things to eat. We then watched the Japan vs. Canada game. 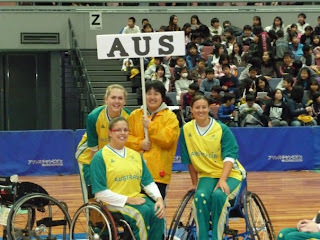 Then it was time for our game against USA. Starters being Kylie, Tina, Dori (yeay!! first international game and starting! ), Cobi, and myself. We won! Woo hoo! Congrats to John T. for his first international game as coach as well as first win as coach! We won by 19 points (HR Max 185, avg 136). BUT! We were still into the final. The top 3 teams all only won one game. 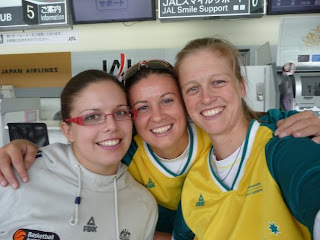 And since we beat USA by such a high margin, we were able to get into the final. I was absolutely exhausted after that day. Im pretty sure I fell asleep on the couch where he held our team meeting. Early night to bed that night! We won! Can't remember the score. 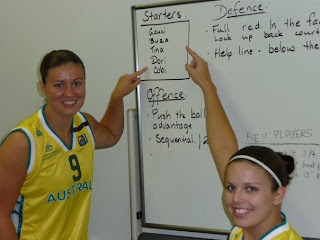 Check the Basketball Australia website if you want to know more stuff like stats and scores. But we won! Yeay! It was such an awesome way to start off 2009. New look Gliders and we are successful! I was so proud of everyone. That night was the closing dinner. 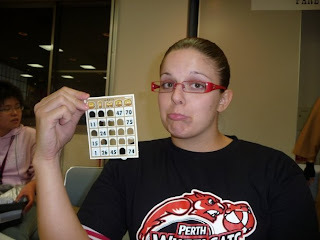 We played the "BINGO SHOOT!" game like we do every year. I was pleased to see the lasagne there again this year. 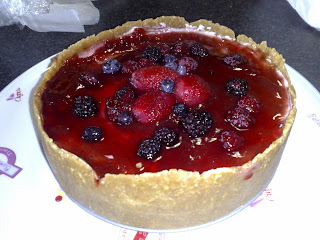 Sooo good! There was also the usual free saki and Japanese beer, but I stuck with the whatever it was juice in the poppers/fruit boxes. I think it was orange juice. Think being the main word. I cant read Japanese yet. Congrats to Kylie for making the All Star 5 and also to Cobi who was tournament MVP. We then went back to our hotel and the celebrations continued. Canada and Australia mingled together, chatted, laughed, drank, ate. One by one we slowly went back to our rooms to pack and then go to bed but a few energentic individuals were able to stay up for a fair bit longer. Okay, just a note to finish off with. During the tournament in one of the games I got fouled off. I can't remember if it was the first or 2nd game that we played. I think it was the first game but not entirely sure. But anyway, there wasnt that much more time left in the 4th quarter. The girl I was defending had the ball but then lost control of it. As I was reaching to try get the ball (which was loose and near the side line) I think I chair fouled her. I felt extremely bad because due to classiication points, for me to come off meant that other Gliders had to be subbed off so we could put a different combination on court. So if your a Glider who was subbed off because of me being stupid and getting too many fouls, and if your reading then, then i'm sorry! I will try not be that stupid again..
Well this wont be very detailed. 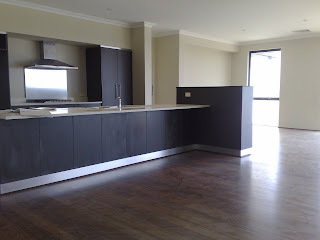 Read my AIS blogs if you want detailed..
Today I had my last on site meeting before handover. Looking good!